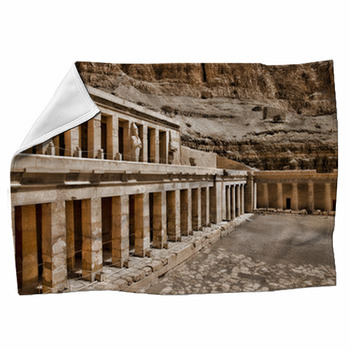 Bring home the treasures of Tutankhamen with these custom Egyptian blankets. 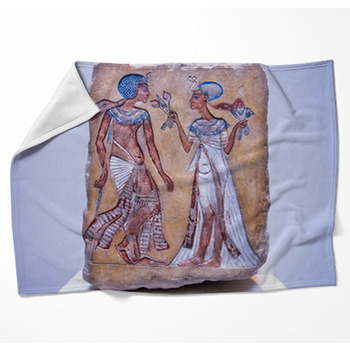 Cover your bed with a fabulous array of green papyrus and pharaohs masks woven into a tapestry-like wall art in some underground tomb. 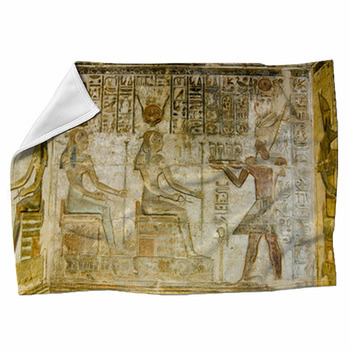 Wrap a peacock around the head of a pharaoh and put classic Egyptian imagery on a custom throw blanket. 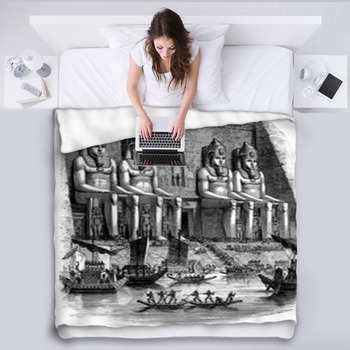 Put the lasting faces of Sphinx and pyramid against a fist of cloud in deep blue skies, or light up the pyramids with a golden sunset on a warm Egyptian fleece blanket. 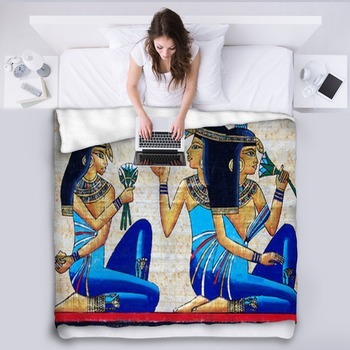 Display Egyptian art on your bed in brilliant turquoise and navy or the warm orange tones of a golden eagles wings. 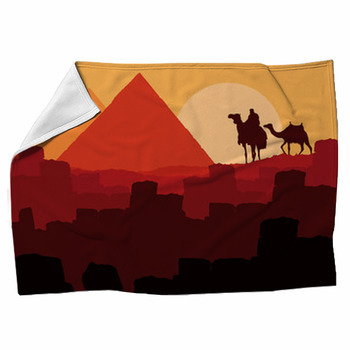 Put the colors of the desert and the camels that cross it on a bed blanket with beautiful Egyptian imagery in the tones and craftsmanship of the design. Place a pyramid like a healing crystal in the hand of a queen in Egyptian headdress, shaded against the warmth radiating in peach skies from a golden sun. 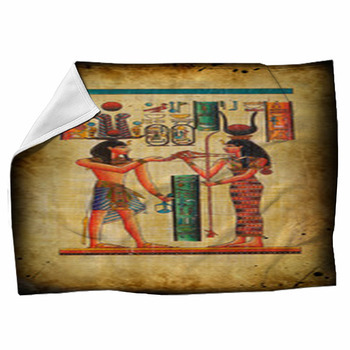 Put a jumble of imagery left behind by Roman foes and allies in an intricate Egyptian themed throw blanket. Wrap a pink veil of mystery around your shoulders. 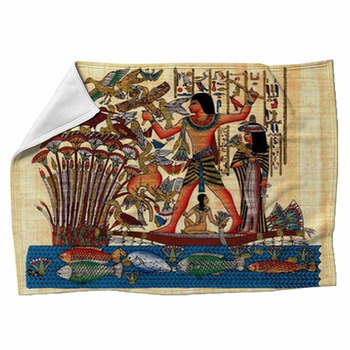 Leave an ancient Egyptian hunting scene on your bed, with a tall dark-skinned archer and a golden lion by his side, bow drawn on blue herons lifting out of the papyrus. Dig under African deserts for the meaning of symbols and ancient hieroglyphics. 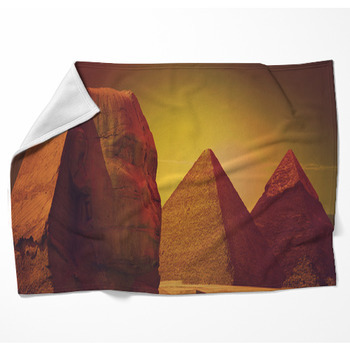 Contemplate the majesty of ancient Egypt. 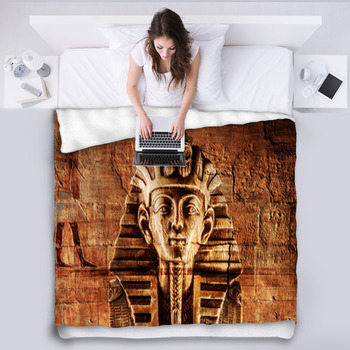 Add the spectacular mask of Tutankhamen and the jackal-headed gods of to your decor on fleece blankets and get a taste of Egypt from your own home.